Supported by a local Friends chapter and located on 71,100-acre Clarks Hill Lake near Augusta, this park is known as one of the finest bass fishing spots in the nation. Boat ramps provide easy access to one of the Southeast’s largest lakes. During the summer, guests can cool off at the sandy beach or on miles of shaded nature trails. Many programs are hosted throughout the year, such as astronomy programs, concerts and nature walks. Bike riders who explore this park can join the Muddy Spokes Club. Mistletoe State Park has 10 fully equipped cottages on the lake, five of which are log cabins. The campground is situated on a peninsula, offering spectacular views of both sunset and sunrise over the open water. A four-bed camper cabin with electricity and water faces the lake. Overnight guests may rent canoes to explore the large lake. Biodiversity and terrific recreational opportunities are enjoyed at Mistletoe State Park in Appling, Georgia. With the park's wide assortment of opportunity along with a dedicated staff and devoted team of Friends volunteers, perhaps it's no surprise that this park welcomes thousands of students every year for educational field trips. 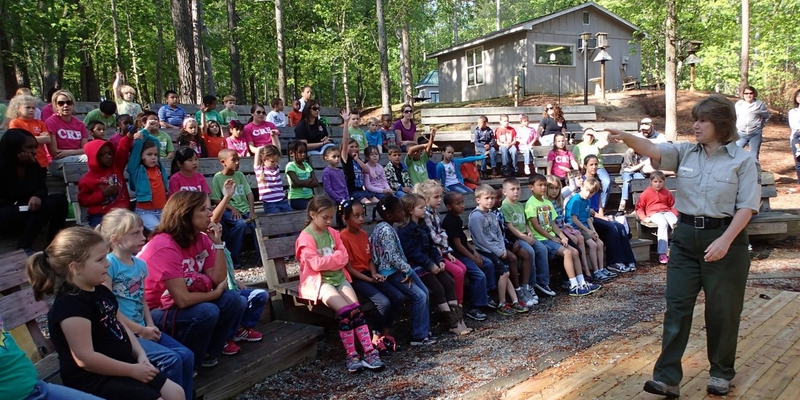 During 2014, 45 schools brought a total of over 3,000 students to Mistletoe State Park for programs that correlated with Georgia Performance Standards. For a full listing of events and information about Mistletoe State Park Historic Park visit the Georgia State Parks page.